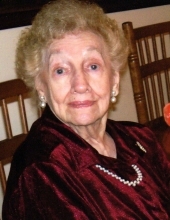 Harriet M. Crockett (Simon) affectionately known as “Nanner,” passed away on October 6, 2018. She was a graduate of South Philadelphia High School (Southern) and a member of the Third Baptist Church. Harriet married her husband, Ben Q. Crockett, a native of West Virginia in 1942. It was during World War II while he was serving in the US Navy. Ben was aboard the USS Washington which was engaged in many battles in both the Atlantic and Pacific. Ben returned home safely. In 1962 they moved to Woodbury with their three children, Ben Jr., David, and Judy. Harriet was employed for five years as a receptionist at the Beltone Hearing Aid office in Woodbury. When the company relocated she became employed at the old Charming Shoppe, and was there for 13 years as a credit clerk and cashier. She loved her position and all her co-workers, and made many life-long friends. Harriet was a member of the Presbyterian Church at Woodbury and belonged to the Women’s Association. There, too, many special friendships were formed. Harriet will be remembered fondly for all of the heartwarming cards, notes, and letters she wrote to family and friends alike. It was something from which she derived much pleasure. She also found much joy in music that stretched across the years. From the beautiful old hymns she learned as a child at her grandmother’s knee, to the lovely ballads of the 40’s and 50’s that she and her husband danced to, to the music of the 60’s and 70’s she enjoyed with her children. All part of a wonderful musical heritage. She was a devoted daughter, wife, mother, grandmother, and great-grandmother. Harriet was happiest when engaged in activities with her family. Harriet lost her beloved husband of 47 years, Ben Sr. in 1989. Seven and a half years later she lost her firstborn son, Ben Jr. (Skipper). Her faith and the love and support of her family saw her through these dark periods and gave her the will to go on. She is survived by one son, David Crockett, Woodbury. One daughter, Judy craig and her husband John Craig Jr. of Pittsgrove. One granddaughter, Jill DuBois and her husband Brian DuBois of Pittsgrove. One grandson, John Craig III and his wife Jennifer Craig of West Deptford. Six precious little great- grandchildren, whom she adored and who filled her final years with unimaginable joy. They are Brooke DuBois, Madison DuBois, Cole Benjamin DuBois, Ashley Craig, Katelyn Craig, and Abigail Craig. Harriet was predeceased by one brother, Joseph Simon Jr. and his wife Eileen. Also, one sister Claire Costigan and her husband Francis. A memorial service will be held at Budd Funeral Home, 522 Salem Ave. (Kings Hwy), Woodbury, NJ at 10:00am on October 11, 2018. Friends may gather one hour earlier to meet with Harriet’s family. Burial will be immediately following at Eglington cemetery. In lieu of flowers contributions may be made to:Heartland Hospice, 1385 Chews Landing Rd, Laurel Springs, NJ 08021-2760 orVisiting Angels, 397 Bridgeton Pike, Mantua, NJ 0805. Memories may be shared at www.buddfuneralhome.com. To send flowers or a remembrance gift to the family of Harriet M. Crockett, please visit our Tribute Store. "Email Address" would like to share the life celebration of Harriet M. Crockett. Click on the "link" to go to share a favorite memory or leave a condolence message for the family.